The "Big Feed" at The Way of the Cross (El Camino de la Cruz) happens each year on December 28 and 29. Teams of short term missionaries arrive from all over the States to participate in a day of outreach and to help put on a family fun fair on a vacant lot in Matamoros, Tamaulipas, a city of one million people just over the Mexican border from Brownsville, Texas. This year Juanita and I were able to take part for the second year in a row. 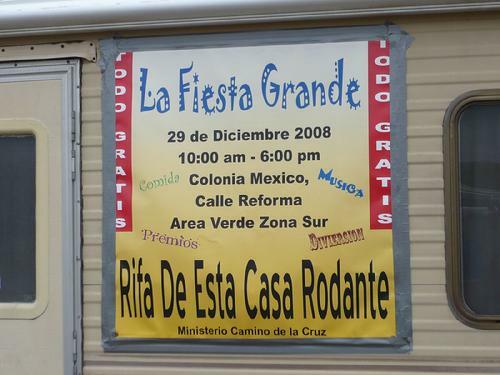 This year saw the biggest group yet (358 short-term missionaries, plus 80 short and full-time WOTC staff from the States side, and many Mexican national missionaries, pastors and others) entertain a group of over ten thousand people from the neighbourhood surrounding the vacant lot used for the Big Feed. Day one the teams went across the border in all directions to neighbourhoods in towns and cities from Reynosa to Matamoros and between. The night before we had all attended an orientation session and then met as teams for prayer and to discuss the next day. Two people in our team agreed to preach and six to give testimonies. Our Blue Team (Team Leader Annette Trejo from WOTC and a group from New Hope Church in Sioux City, Iowa) in two vans went in a convoy of six vans (three teams) to cross at Los Indios and met with three local pastors. The teams split up and each did two outreach programs in different parts of Rio Bravo (literally "wild river") which is also the name that the Mexicans call the Rio Grande River. Blue Team partnered with pastor Enrique. We followed pastor Enrique's mini-van to our first location, a small vacant lot on a street corner in Rio Bravo. His van had a loud speaker and he announced our arrival and the 2 P.M. outreach and then parked it with loud music emanating as a beacon to the curious. While we waited to start I handed out a few tracts and visited with some bystanders including Noe (Noah), the owner of a nearby tienda (corner store). Then the music on the van was shut down and the team started singing kids songs and then other songs. Then a few team members gave their testimony followed by one of them preaching and an altar call. During the preaching time the rest of the team moved around the corner of the brick wall and prayed. Then everybody lined up. The team members handed out gift bags and prayed with or interacted with the local people as seemed appropriate. It seemed far too soon and we were saying adios and loading ourselves in the vans and driving to the next location to do a repeat. The second location was a bit more rural and a lot larger than the first. One of the locals said that it was to be the location of a Casa de Hogar (home for kids in need - kids which may or may not all be orphans) to be constructed in the next year. The team played ball with the local kids as the crowd gathered and then the program was repeated. One testimony in particular touched my heart as well as many others. It was from a man whose nine year old daughter had died two years previously and how angry he had been at God about it and how Christ had still been able to comfort him through his grief and anger. I was a little too misty to see clearly, but think there may have been a few others with similar challenges keeping their eyes dry. One of the team members gathered the kids in close and went through a Kids' EE Cube, the kids' version of an outreach tool. The adult version is called an Evangecube and will be mentioned, as well, in the account of Day Two. It is a collection of illustrated cubic boxes tied together in such a way to form different pictures illustrating a presentation of the Gospel message. More gift handouts. More visiting and then it was almost dark and time to head back to our assembly point and meet up with the other two teams and make a run for the border. We had crossed into Mexico at the Los Indios crossing due south of Harlingen, but we returned at the Neuvo Progreso crossing further west. The team planned to return here for shopping before heading north the day after the Big Feed so as we drove through town we answered their questions about shopping and restaurants there. This was a bit tricky for me since as driver I was also trying not to lose the lead van or hit any people or vehicles in the crowded shopping area leading up to the bridge across the Rio Grande. Uneventful border crossing (the best kind) and then a drive over much better roads home to the base and a supper of taco salad. Over 10,000 pieces of chicken. Hundreds of free raffle and game prizes, from candy to stuffed toys to sewing machines to a motor home. Thousands of free gift bags. Thousands of people showing up interested in same. Thousands of people hearing the gospel message throughout the day and responding. This is the third year for the Big Feed at this particular vacant field in Matamoros. The general format remains the same as past years in this spot and in the other spots the Big Feed has been held. There is a flat deck semi-trailer at both ends of the field. Each has a p.a. (public address) system and each is stacked with prizes to be given away. At one side of the field grates are set up over charcoal for cooking chicken. At the other side of the field midway type games are set-up. Upon arriving at the site each person is given half of a strip ticket. The other half goes into a container for a draw. Typically a raffle will be announced from one of the p.a. systems. A crowd will gather at that semi trailer and songs will be sung, a message preached, decisions called for and some tickets pulled and prizes handed out. A while later a raffle will be announced at the other end of the field and the crowd migrates and the process happens again. This year they had problems with one of the p.a. systems so all the raffle action ended up happening at one end of the field, but there was plenty of action elsewhere on the field. Everything is free including the prizes for the midway type games that are played by all ages. Once an hour a horn blows and play action stops at the games and a team member there (in our case pastor Enrique) preaches a quick message and asks for a decision and prays with those making one. Once an hour another horn blows and all the team follow their colored flags and rotate to new assignments at one of the other booths or to cook or pray. Late in the day tables are set up and lines form and chicken and beans and a gift are handed out to each person. This year the 10,000 pieces of chicken were not enough to give one to each person attending which is the first time that has happened in the history of the Big Feed. On day two I drove a van, but Juanita stayed back to help cook. One of the other SOWER ladies took her place at the Big Feed and had the experience of a lifetime. In addition to the normal Big Feed activities, this year somebody trained 50 local pastors in the use of the big Evangecube and sent them out onto the Big Feed grounds with a challenge to use the cube and to report back on their results. 1,800 was the total they reported back at the end of the day. View a presentation of the Evangecube below. Well, this page has a lot of words, but it is just an overview of two days packed with experience. However, if you've made it this far you've got time for one last paragraph. Right? One of the team members on the Blue team was down for his first Big Feed. He is approaching retirement from his job teaching Spanish in an Iowa high school and contemplating his options for a useful post retirement life. A couple of years ago he gave a Spanish Bible to a friend that was coming down to Matamoros to do some church construction. The day of the Big Feed he was talking to one of the Mexicans that showed up for the event. They hit it off and the local man wanted him to write his name in the man's Bible. He opened the Bible and said "my name is already here. Where did you get this." The man's friend from Iowa gave it to the Mexican brother. You never know who you will meet, do you?